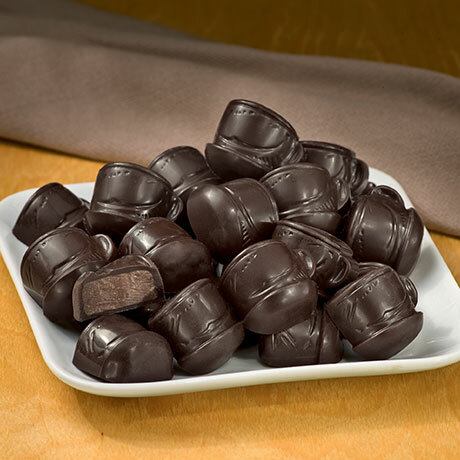 Rich, dark chocolate filled with mocha truffle and real coffee. 6-ounce box. Please note: Shipping may be delayed until temperatures drop below 80 degrees. May Contain: Peanuts, Tree Nuts. Dark chocolate (sugar, chocolate, cocoa butter, anhydrous milk fat, soy lecithin, vanilla), sugar, corn syrup, milk chocolate (sugar, cocoa butter, whole milk, chocolate, soy lecithin, and vanilla), sunflower oil, contains less than 2% of water, butter (pasteurized cream, salt), coffee powder, cream powder (sweet cream, nonfat milk, sodium caseinate), invert sugar, medium chain triglycerides, natural and artificial flavor, BHA, potassium sorbate (to retard spoilage), salt, sorbitol, soy lecithin.